The Auditorium Testori of Palazzo Lombardia, crowded with peoople, has hosted the “Awards Cerimony” of “SPORT MOVIES & TV 2018 – 36th MILANO INTERNATIONAL FICTS FEST” world Final Cinema, Television, Culture and sports Communication Championship of 16 Festival (in the 5 continents). The Ceremony was opened by the performance of Fanfara Terzo Battaglione Carabinieri Lombardia, by the video messages of the IOC President Dr. Thomas Bach, by the FIA President Jean Todt, by the regards of the FICTS President (Fédération Internationale Cinéma Télévision Sportifs) Prof. Franco Ascani, by the Undersecretary to the Presidency of the Council of Ministers with responsibility for sport On. Giancarlo Giorgetti and by the President of the Lombardy Region Dr. Attilio Fontana. The Russian Soprano Olga Lehmann-Balashova has sung “Casta Diva”, the aria of the protagonist of Vincenzo Bellini’s “Norma”. Prestigious guests from the sports, film and television world attended the final evening of “SPORT MOVIES & TV 2018”. They have been awarded of the “Excellence Guirlande d’Honneur”, the highest honor of the FICTS, considered the “Oscar of TV and Sport Cinema”: Alisher Usmanov, President of the FIE, the international governing body of fencing as well as philanthropist of sport. The Italian actor and comedian Lino Banfi has been awarded with the “FICTS Guirlande d’Honneur” while the Director of the Nice National Theater Irina Brook (daughter of playwright Peter Brook) received the “FICTS Diamond” and Mikhail Kusnirovich (Bosco Sport and Magazzini Gum in Moscow). The pictures of all days of “Sport Movies & Tv 2018” are available at link http://www.sportmoviestv.com/fotos/sport-movies-tv-2018/. The “Opera Prima – Enrica Speroni” Prize was awarded to the film “250 Steps” (PGM Network / Sportnetwork – Serbia), dedicated to the Yugoslav national youth team that won the title of World Basketball Champion led by the legendary trainer Svetislav Pesic in Bormio in 1987. The “Candido Cannavò Award for the Olympic Spirit“, dedicated to the “historic” Director of the “Gazzetta dello Sport” was assigned to the production “One Shot” (Olympic Information Services, IOC – Switzerland) explores the fundamental role of the sports photographer to capture at the Olympic Games in Rio 2016 the iconic moment of a sportsman.“Pelé: O Rei Desconhecido” (Alicia Lerer, Paul Rubens Sampaio – Brazile) rare representation of Pelé’s figure during the 1958 World Football Championship received the “Bruno Beneck Critics Award”.“Sports Stories” (Rai Ragazzi, Rai Gulp – Italia) real stories of teenagers who have chosen to get involved has been awarded the Daniele Redaelli Award “Sport and Solidarity”. 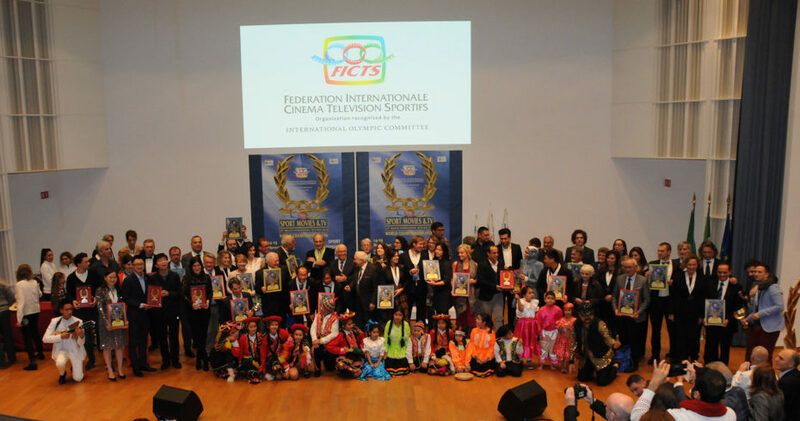 Among the winners of the 9 Festival Sections: “Olympic Spirit – Olympic Values” section, “The people’s Fighters: Teofilo Stevenson and the legend of Cuban boxing (Olympic Channel – Spagna); “Documentary – Individual Sport”, “Sarah, la combattente” (416 Prod – Francia); “Documentary – Team Sport”, “Semper Vivens – still alive” (Olympique d’Antibes Juan-les Pins Basquet – Francia); “Tv Shows & Sport Adverts” “Emblem of Olympic / Paralympic Winter Games Beijing 2022 (Shang Guang Chuan Mei Beijing Co. Ltd – Cina); “Movies”, “I am Iranian” (Shayanfilm – Iran). The complete list of the winners of “Sport Movies & Tv 2018” is available on http://www.fictsfederation.it/jury_minutes_2018.pdf. A wide participation on a national and international scale, a critical and public success, in the presence of sports champions, Institutional and sports authorities, producers and international directors, have characterized the 36th edition of “Sport Movies & Tv” awarded the “Medaglia del Presidente della Repubblica” by the President of the Italian Republic Hon. Sergio Mattarella. Six days of cinema, sport, television and culture: 160 Projections (120 hours divide into 7 sections) selected among 970 participating works at the Selections (International Jury chaired by Dr. Carlo Bozzali) from 35 countries, 30 World and European premieres and 30 hours of exclusive Olympic images, 51 Sport Disciplines, 810 Big Champions on the screen, 207 Directors and Producers, 210 accredited journalists, 174 Broadcasters involved, 93 Olympic and World Medals, 5 Exhibitions, 10 Meetings, 80 National and International Guests, 1 Olympic Area, 4 Connected Events, 85 Production Houses and 64 TV Networks.